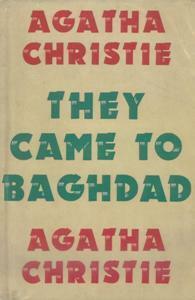 They Came to Baghdad is a work of detective fiction Agatha Christie and first published in the UK by the Collins Crime Club on March 5, 1951 and in the US by Dodd, Mead and Company later in the same year. The UK edition retailed at eight shillings and sixpence (8/6) and the US edition at $2.50. The book was inspired by Christie's own trips to Baghdad with her second husband, archaeologist Max Mallowan and is also one of few Christie novels belonging to the action and spy drama genres, rather than to mysteries and whodunnits. Flighty but good-hearted Victoria Jones craves love, intrigue, and adventure. She strikes gold in Edward, a handsome and mysterious traveler whom she's vowed to follow to the ends of the earth. Yet no whirlwind affair can prepare Victoria for what unfolds once she lands in Baghdad. Not a day in Edward's shadow, and she hears whispered warnings of danger and witnesses the murder of a secret agent in her hotel room. And when she discovers that a romantic rival for Edward's affection has arranged for her kidnapping, Victoria fears that her impetuous nature could be the death of her.